Bassist Simon Woolf and drummer Steve Brown join forces for the first time with multi-faceted pianist Benet McLean, to form a 'conventional', hard-swinging jazz trio. 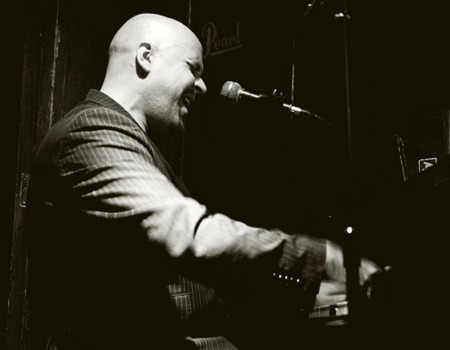 London born pianist and vocalist Benet Mclean has been involved in music since the age of 3. He began on violin and whilst training to become potentially a classical concert violinist, he also became interested in other forms of music such as jazz, bebop and hip-hop. Soon teaching himself other instruments such as guitar, piano, electric bass, alto saxophone, as well as, of course, singing and composing, a musical 'melting-pot' began to 'cook'! His bands have always been eclectic, drawing on a wide variety of sources and influences, although his playing is rooted in the tradition of great jazz piano playing, from Fats Waller to Bud Powell and beyond. He has toured internationally since the early 90's and has released two albums, In The Land Of Oo-Bla-Dee and Cliches (For Another Day). Recently featured alongside leading players from all over the world at the "Bass 2012" convention in Copenhagen, Simon Woolf is a lyrical double-bassist in the tradition of his great idol, Red Mitchell. Woolf has enjoyed long associations with leading UK and US jazz artists and he has appeared in the West End in runs of Cy Coleman's I Love My Wife and the National Theatre production of High Society. As well as double-bass, Simon Woolf performs live on piano and bass guitar, and writes and arranges for his own and other ensembles. Steve Brown started playing drums at the age of fifteen and has become one of the most sought-after drummers in the country. He studied in New York in the early 1990s with Carl Allen and John Riley. As part of the Jim Hunt Quartet, he was a finalist in the European Jazz Competition in Germany. He has worked with almost every major British artist, and has accompanied many visiting Americans. In addition to being part of Scott Hamilton's Quartet since 2000, he is a member of John Bunch's British trio, and has recorded a number of albums with both of these groups.